In the reenacting hobby, you will hear the word “authenticity” used in just about every other sentence. What this means is that everything your wear, use, or do in this hobby should be authentic to the time period. For WWII, there are still plenty of original items available and in the past 10 years, quality reproductions have become available. 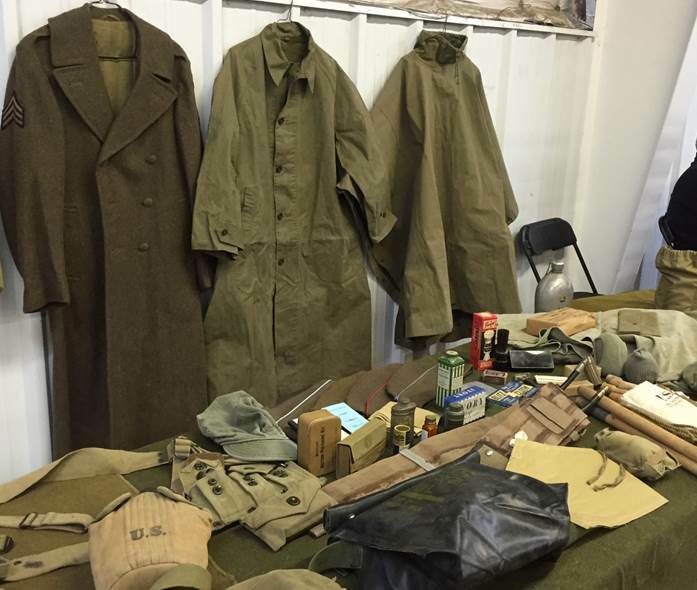 There is a lot to learn about uniforms and equipment of WWII. Just because something is Army issue, is green and has US stamped on it, doesn’t mean it is appropriate for this impression. 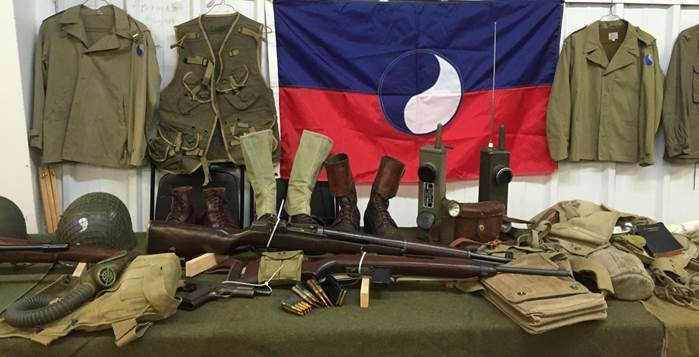 Don’t run down to your local surplus store and expect to find WWII stuff just lying around. Just because it is an M-1 Helmet, doesn’t mean it is a WWII M-1 helmet (yes, there is a difference). So before you go rushing off to buy everything, wait and have one of us assist you so you won’t spend a lot of money on things you can’t use (we will assign a sponsor to help you in this difficult buy very enjoyable project). It will actually cost you less to do it right the first time than to try and get by with something that is not correct and you can’t use. Authenticity means having the correct uniforms and gear, not “close enough”. All uniforms, equipment, and weapons will be appropriate to the 29th Division during their service in World War 2 up to June 1, 1944. Any modifications of the standard uniform and equipment will be made accordingly for each specific event and time frame being portrayed. The impression we are trying to put forward is that of the average line grunt, we are not an elite specialty unit. The following listed uniforms and equipment are the essentials required for the basic impression. This may seem like a lot of equipment and uniforms, and it is. But it is the basic kit of what the soldier would have had issued to him. If you are new to this hobby, do you need to go out and buy everything for your first event? No, however, you need to have the basic field items, which would be the OD wool uniform, boots, leggings, jacket, web gear, rifle, and helmet (items marked with an * below.) You can acquire the other things as you find them. The good thing about Army items is that they were all dated. When buying WWII items, you need to buy things that are dated 1944 or earlier. Some items that are dated later can be used but you have to know what they are and some things dated 1944 you can’t use. Research is the key to this hobby. We have a lot of experience people in this group that are more than willing to help out. As a rule, we wear the olive drab (OD) wool uniforms. You should eventually get two sets of the OD wools; one for the field and one for dress. The HBT (cotton herringbone twill) fatigue uniform is only worn on certain work details. With the selection of reproduction uniforms available, not to mention original uniforms, it should be no problem putting together a complete kit of US Uniforms. Although originals are available, if you are a large person (42 chest, 38 waist or above) you will probably only find reproductions in your size. All jackets and shirts will have the 29th Div. patch on the left sleeve. The patch should be approximately 1/2 inch from the shoulder seam vertically oriented on the sleeve with the blue field facing to the front (* = required.) More Guidance is available in the Unit Handbook and on the Research page. 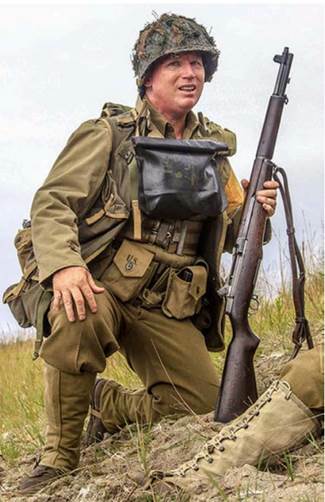 All canvas web gear and other equipment should be dated 1944 or before. Helmets should be the WWII M-1 pattern with sewn-on khaki web chinstrap, either with fixed chinstrap bales (preferred) or swivel bales. Helmets made post-1950, and/or with clip on chinstraps are not acceptable. Helmets are to be marked with the correct 29th Div. emblem on the front. NCOs should mark the back of their helmets with a white horizontal bar approximately 4 inches long by 1 inch tall. Officers should mark the back or their helmet with a white vertical stripe approximately 1 inch wide by 4 inches tall. More Guidance is available in the Unit Handbook and on the Research page. The U. S. Rifle, Cal. .30, M1 semi-automatic rifle or Garand rifle, was the standard arm carried by an infantryman during WWII. The 1903 Springfield rifle may be used if that is all you have available but the M1 is preferred. Specialized weapons such as the M1 carbine, or 1911A 1 automatic pistol will not be used unless authorized by the platoon commander. One Browning Automatic Rifle (BAR) is authorized for each rifle squad. More Guidance is available in the Unit Handbook and on the Research page. 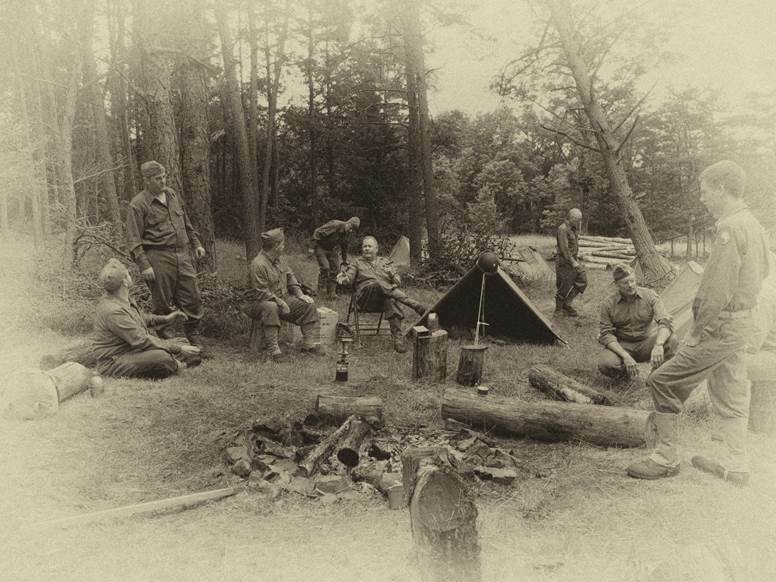 From the beginning, the 29th ID has been the leader in living history impressions. We are known for a quality barracks impression, which is why we recommend and encourage you to obtain a full kit. Many of the programs that we do involve the life of the soldier in the barracks as well as the field. The following listed items are required for a barracks impression. These items will enhance your impression and will help increase your personal comfort as well. Many of the personal hygiene disposable items such as toothpaste and shaving soap can be period commercial (civilian) items. More Guidance is available in the Unit Handbook and on the Research page. We have established a living history program to show what the first wave of troops (Assault Boat Team) that assaulted Omaha Beach on June 6, 1944 wore. These items were generally issued to the 116th Infantry Regiment, who made the initial assaults on D-Day. These items are only required if you want to participate in this demonstration. Other items may be required, depending on the team you belong to. The M5 Gas Mask, which goes into the M7 Gas Mask Bag is an expensive, and somewhat scarce item. It is a nice to have, if you can afford it or find it really cheap, but not required. In the meantime, stuff something into the rubber bag and hope there are no gas attacks. More Guidance is available in the Unit Handbook and on the Research page. Sometimes it’s the small things that can make or break an impression. Sometimes it things so simple we forget about them. Watches – Should be regular dial faced watch with 1940’s style watch bands (you can research these in 1940’s magazines). Plain simple Timex’s work. Glasses – If you wear glasses, consider wearing contacts for the day (if you don’t already). If you can’t wear contacts, you need to get a set of frames that are similar to Army issue or Civilian purchase. You can buy old frames and get your prescription put in. Again, research the pictures of the time period. There are some optometrists that specialized in re-enactor eyeglasses. Modern frames won’t work.